Above: Main exhibition area in "The Lid" at Gilwell. 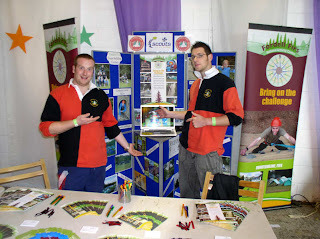 Each year a few staff and Fellowship members travel down to the Scout Association's headquarters at Gilwell Park, outside London, to take part in the Gilwell Reunion and promote the centre and Scottish Scouting. This year was the 81st reunion and was well attended by many current and former scout leaders from all over the UK and beyond. After rising at the ridiculous hour of 4am the team departed Fordell just after 5am armed with a car-load of display materials, some refreshments and vague directions to Gilwell. Many hours, stops and the odd unintended detour later, they arrived at Gilwell mid-afternoon just in time for the event beginning. 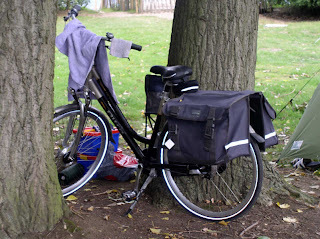 Above : All the way from Holland...tired bike having a rest before the return journey. Saturday morning and another early start in order to set up the Fordell display stand for the exhibition area in "The Lid" (Gilwell's version of our wet weather hall). After a few power problems and trying to optimise the space available a reasonably functional display was created and manned from 10am till 4pm. 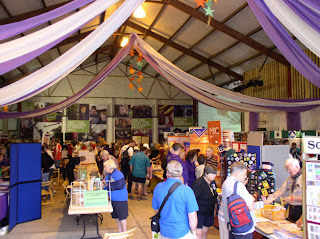 The event was very well attended and there was a good deal of interest in the centre from many groups. A common complaint was that Fordell was too far to travel to from the south of England with young children, but it was pointed out that some groups choose to hire all their camping equipment from us and can then fly cheaply into Edinburgh with only their personal equipment where it is a short journey to the centre. Overall the event seemed to go well and many groups took away information packs and booking forms which will hopefully lead to them visiting the centre soon. An early departure from Gilwell was made on the sunday in order to avoid any major traffic problems, ironically the roads were competely clear until the last 50 miles, with huge delays at both the Forth and Kincardine bridges. Arriving back at Fordell just after 6pm, there was little sign of any campers who, it must be presumed, had all left the site and were now sitting in the same traffic jams at both bridges. Above : "Come to Fordell! We've got a laptop!"